Remember that game that scared you half to death on PS4 two years ago? Yes, Layers of Fear, that’s the one. Now you can thank your lucky stars (or unlucky, depending on how you feel about horror), as it’s now available on the Nintendo Switch as of February 21st. Is that the sound of hellish cheering we hear? That must mean that it’s competition time! To celebrate the release of Bloober Team's Layers of Fear: Legacy, we’re giving away one digital copy of the game and a brand new Nintendo Switch console. The competition is simple: all you have to do is click this link and fill in your email address (psst - there’s a limit of one entry per person, and it’s only open to the US and the UK). The opens at 17:00 GMT on February 21 and closes at 00:01 GMT on 26 February, so make sure to enter by then to be in with a chance to win this heart-pounding game and a brand new console just for you. I mean, if you’re brave enough to tackle this chilling tale once again. Layers of Fears: Legacy places you in control of a mad, obsessive painter (did we mention it takes place in a creepy mansion too?) who only cares about their work reaching perfection and will stop at nothing - and we mean nothing - until it’s achieved. 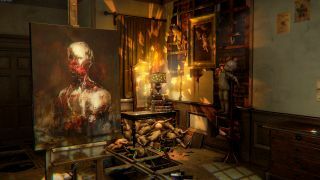 Layers of Fear: Legacy has been fully optimized for the Nintendo Switch, with redesigned controls that let you open doors and boxes with your hand movements. Just so you can feel even more immersed in all the horror. That’s a good thing, honestly. For more great games to play on the Switch, both old and new, check out our best Nintendo Switch games you can play right now.